﻿ Lek Apartment, Pattaya | FROM $12 - SAVE ON AGODA! Have a question for Lek Apartment? Well-placed in the beaches, nightlife, shopping area of Pattaya city, Lek Apartment provides a most conducive spot for you to take a break from your busy days. From here, guests can enjoy easy access to all that the lively city has to offer. No less exceptional is the hotel's easy access to the city's myriad attractions and landmarks, such as Slices Pizza, Witherspoons, Mc Donald's. Take advantage of a wealth of unrivaled services and amenities at this Pattaya hotel. This hotel offers numerous on-site facilities to satisfy even the most discerning guest. Step into one of 26 inviting rooms and escape the stresses of the day with a wide range of amenities such as internet access – wireless, internet access – wireless (complimentary), non smoking rooms, air conditioning, desk which can be found in some rooms. Besides, the hotel's host of recreational offerings ensures you have plenty to do during your stay. Lek Apartment is an ideal place of stay for travelers seeking charm, comfort and convenience in Pattaya. Spent one night there in room with fan. Can't say about food/dining in hotel, but there are plenty of food and everything just in 1-5 minutes by foot. Good internet connection. Friendly stuff. The hotel is old but good (for this money) and clean. Night was very noisy because of neighbours in nearest rooms, also my room windows is not constructed to decrease street noise. So, be ready to it. This is a good value for it's money overall. I was in Pattaya and took a look at the LEK apartment before booking. I looked at the room I wanted to have which was off the very loud main street (Soi Diana). After making the booking and arriving to check in, I asked for a high floor. There I realized that there was NO AIR CONDITIONING. So I moved down one floor. Once I turned on the AC I realized that it too was not working. Then management offered me the only room with working AC. The room facing the bar which doesn't close until 2 am and next to a motorcycle taxi stand where the drivers clap their hands yelling "taxi, taxi" until 4 am. Needless to say I checked into another hotel the next afternoon. I paid for three nights but couldn't stand more than one. Good pricing (considering the paid price) with large room. Acceptable cleanliness and room comfort. 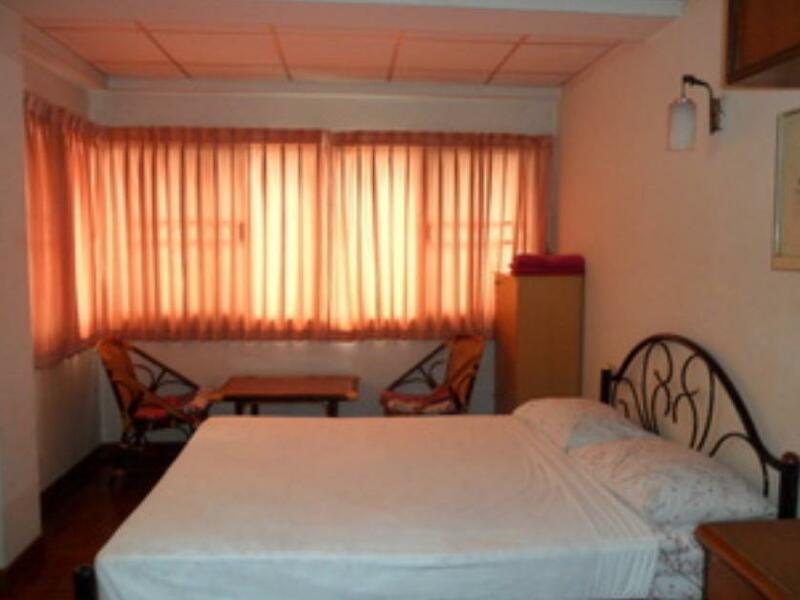 Hotel is located within walking distance (~1.5 km or 20 minutes walk) to Walking Street. There are two motorcycle taxi stations nearby hotel. Currency exchangers, massage parlours and bars are within a stone's throw away. Street food (BBQ meat and fish balls, fried noodles, noodles in soup, etc.) are available from a few push carts set up along the street leading to the hotel. For those picky eaters, there is a Subway restaurant right at the corner of the road. Staff was very friendly and helpful. Room was basic but large. It's a very basic hotel with clean sheets, tv, and even the fan room had hot water. Free water was provided. The location is good, not smack in the middle of Pattaya but close enough and close to the Walking Street, the beach, and Central department store. Everything was clean except the walls in the bathroom which hadn't been scrubbed recently and a quick rinse took care of that. The bed was large and firm but not super hard. The room even came with a refrigerator but I didn't plug it in to keep down the noise. There was some music coming in from the music lounge across the street until the middle of the night but considering the location, it's overall a good deal for what you get, especially for the size of the room. I have stayed at The Twins Palm Resort prior moving to Lek and payed more then double more but wasn't even close satisfied as it was at Lek. For extra 100 about $3 AUD they gave me a room with Aircon. Clean, Central location attentive staff. My stay at Lek apartment was one which I will never forget. In brief, I must stay at this hotel whenever, I intend to come to Pattaya. Oh fantastic. I'd strongly recommend Lek Apartment if you're on a budget trip. Do not expect a clean apartment because there never is but you can expect a friendly staff. I was on holiday for christmas break and the guest were invited to have meal organised by them.Staying on the top floor, the staff volunteer to carry my luggage. That's one of the plus point. The walking distances to many great places like Pattaya beach road, Alcazar & Tiffany show and Walking Street is not too far actually. I actually walked to those places. Or taking "tuk tuk" when my leg sores. No need to worry about food and massage. Tons of food and massage parlour along the street. So overall my stay is quite enjoyable and will definitely come back. When I checked in, the disk clerk complained to me that Agoda did not give them enough time to inform them that I was coming and that I should not use Agoda again. The toilet didn't work well -- multiple flushes were needed. No hot water the whole time (12 days) even after complaining about it few times. WiFi signal was too weak to be useable. The room was in poor overall condition, such as water stains in ceiling, rough condition of furniture and fixtures. Leaky plumbing (toilet and faucet). This should be a no star hotel/apartment. The guesthouse is very well located, close to everything, but it is very hard to find the guesthouse itself. Check the address and look very carefully because it has no sign on the street. The staff is very attentive and it is a friendly familiar atmosphere. You get a room with everything you need for a low cost and the surroundings are lively and interesting. Uneventful except for check-in. Hotel was severely overbooked and they turned many people away. I went in a day before to confirm my reservation and they tried to turn me away as well. When I did get a room, it didn't have the WiFi, and when I asked about it the harried manager told me if I wanted that I should stay 'at expensive hotel, not cheap hotel'. Enough said. I am very happy to stay in Lek Apartment for the 4 nights in Pattaya. It is easy to go to most attraction like Beach Rd, Walking Street, Central Pattaya. The room is ok and big for the amount I paid, its clean and staff cleans the room every day. I am quite happy with Lek Apartment and will stay next time again. For a budget hotel and possible long stay in a busy night life area I would highly recommend for the single male or female. The owner lady was very friendly and when I needed laundry done for that day she stated no problem. 2 hours later she returned the laundry fast and pressed. With a dryer and not air dried. For the money and location I would recommend this hotel for the single traveler. Centrally located,easy access to beach and night-life. It was easy to find the hotel,centrally located and have good access to busy night life and beach areas. So many restaurants near-by. Internet speed was little bit slow.They provide two Wifi connections. Restaurant is there in the hotel. Overall,it is a good value for money and privacy stay is guaranteed. Stay at Lek apartment was around 450 Bhat for which there are very good hotels in the same area. Ceiling fan seems to be 50 years old. We should rotate it first, then it begins its works (but slowly), so they gave an additional table fan (it was a good gesture). 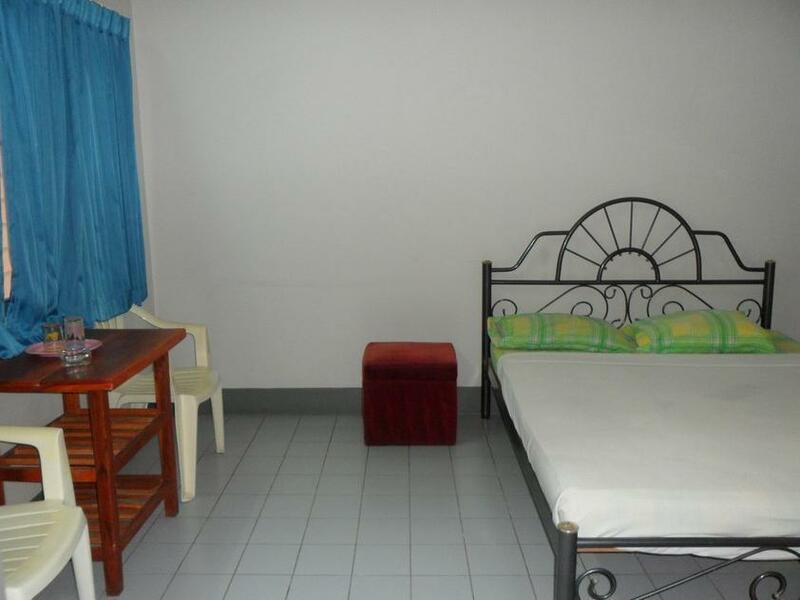 For a short stay Lek Apartments is a good choice. A bit difficult to find on Soy Diana, sign not very big! Staff was very friendly and you could rent safety box in reception. The room was big with both ceiling fan and air condition. Big refrigerator. The bed was quite hard but that is not so unusual in Thailand. Worse was that pillows was very hard as well. Overall I can recommend Lek Apartments. Value for money. bad news was the first night was a disaster but the good news was that i ended up staying for thirty days. because my flight from the us did not get in till after 1am i did not get to my apartment till 4am and to my dismay they gave away my room. so after traveling for over thirty hours on three planes i was told that the only room for me would be dirty. and filthy it was. i accepted the room and was given old but clean sheets, towels and toilet paper. the room had two used towels on the floor so i spent the next hour using those to clean my apartment. there was a nice working fridge in the apartment but also a old unplugged bug infested fridge next to it. i took that fridge and carried it out of my apartment and left it to the side of my room. i than plugged in my boombox that i brought with me from the states only to have it short out after about ten seconds. after cleaning and making my bed i crashed till morning. morning came and i was met at the front desk by the charming bee the owner whom apologized and sent a maid up(joy)whom did a good job of cleaning what i had missed. now if you forget the first night i would say that the lek apartment is everything a budget traveler is looking for. they are all listed in the pros' above. the fact is my agoda stay was booked for one week but i ended up staying for the rest of my thirty days. the day staff was great and made me feel welcome. bee always had a good morning for me and a smile on her face. her austria husband spoke english and would answer any question i had. they made me feel comfortable in my apartment and it ended up being my home for the month. i would recommend this hotel for short stays only and if there is nothing else available. it is close to all shopping and in a alright area. the room is basic and with fan only. also the area is a little load. I had a 420 baht fan room, big room TV, Fridge, free wifi. Some noise at night but not too bad this is Pattaya and you are going to hear the bars at night and construction in the day. Nearby was Diana dragon hotel with 125 baht breakfast buffet. This hotel is on Soi Diana across from LK metro and net to Sawadees hotel.The Agoda map was confusing and the driver had too call the hotel to locate it. City area but quiet place. Large room but old design.